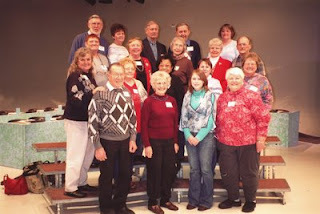 2006 EWGS Volunteers at KSPS pledge drive. If you are a RootsMagic user, or are simply curious about this genealogy software program, you may be interested in the RootsMagic Users Group, which meets at 7 PM on the third Thursday of each month at the LDS Church at 808 E. Sitka (this month's meeting is on April 16th). Lew and Trudy Lundy lead this group. For more information, e-mail them here. If you are a Legacy Family Tree genealogy software user, or are simply curious about this genealogy software program, you may be interested in the Legacy Users Group (LUG), which will meet next Wednesday, April 15th, from 1:30 to 3:30 PM in the meeting room of the Shadle Park Branch of the Spokane Public Library at 2111 W. Wellesley. Regular attendees will take turns in the role of moderator for each meeting. If you have more questions, please contact Donna Potter Phillips here. 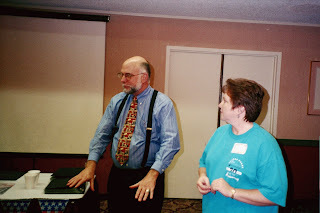 The October 2002 seminar was Researching your Military Ancestors featurng Craig Scott from Westminter, Maryland at the Days Inn on Sunset Blvd.